As an Agent, I sell bandwidth and transport almost exclusively. I am learning that the Channel does not want that business. The carriers do, but on the wholesale/carrier side. No 10GB private lines. No 1GB ports. Nope. The Channel wants Multi-site multi-access customers. That's fine. Just stop talking about your fiber map then. It's irrelevant for that kind of sale. The CLEC's also want Agents to sell Managed Services and anything Cloud. That's nice but who cares? Cbeyond announced that they are "no longer recruiting traditional telecom agents". well, they already signed up the biggest masters - CMS, Telarus, Microcorp, TBI, etc. So what they are really saying is that traditional agents will have to use a master agent to get paid. That's becoming Normal in telecom. Carriers just want to deal with master Agents. I guess, they think that is more effective or efficient. I have no idea if it is either. We'll see, I guess. Like so many other providers, Cbeyond thinks that the answer to its cloud strategy will be VAR's. That's not likely to happen. VAR's don't trust telco. (Heck, I'm still waiting a month for an FOC from XO on an Internet T1, so I totally get the attitude.) VARs already have relationships with VAD's like Ingram and Tech Data, who can provide most of what Cbeyond is offering - or they can provide it themselves. Would you go to Rackspace or Cbeyond or EarthLink for hosting? That's basically what it comes down to: who is doing the hosting. Right now Microsoft itself and carriers are getting into the traditional VAR space (offering hosted Microsoft products and data backup). Why would VAR's shift from a reseller model to a sales agent? It's kind of like, do you want white-label or straight resale? The thing that most miss is that it is all about Control. In white-label, you can build a branded business that you have a decent amount of control over, especially in Hosted PBX. In straight resale, the bill, the brand, everything is in the carrier's name. No control at all. My clients - CLEC, ISP and ITSP - want the illusion of control - or at least as much control as they can get. VAR's want the same thing. In the case of the ISP and the VAR, they like technology, but selling and marketing not-so-much. And you won't have much success forcing them into a sales+marketing shop - any more than you will trying to get T1 slingers become Consultative Sales people pitching cloud. Why? Motivation. Comfort Zone. Robin Robbins has a very successful business offering turn-key marketing programs to VAR's. Cloud providers need to plug in to that kind of a system. Some Agents will obviously move into this space. Some already have making money on Cloud Comm like Hosted PBX, UC, IVR and conferencing. Some have sold collocation - although its a big leap to PAAS and IAAS from colo. But virtualization might be a nice tool in that box. It will come down to who you trust to deliver it. I'm not saying Agents shouldn't be shifting their business. Lord knows that the way it is now, it is extremely tough to make the living we are used to while selling what we are used to. So a shift has to come. I just don't think it will be to the same carriers that make it in the future. When you look at things like commission adjustments, contract disputes, channel segmentation, and the like, Agents might want to try another silo of vendors to see if they get a better shake. There is a tremendous amount of competition for the attention of Agents and VARs. That means that there will be price competition, commission shopping, and other things that the providers do not want to have to deal with right now. The only providers who can afford to be exclusive right now are vertical cloud providers and cablecos - both have an almost exclusive product to offer. Everyone else is selling the same stuff - MPLS, SIP, backup, managed network security, blah, blah, blah. That means the Channel can shop around. 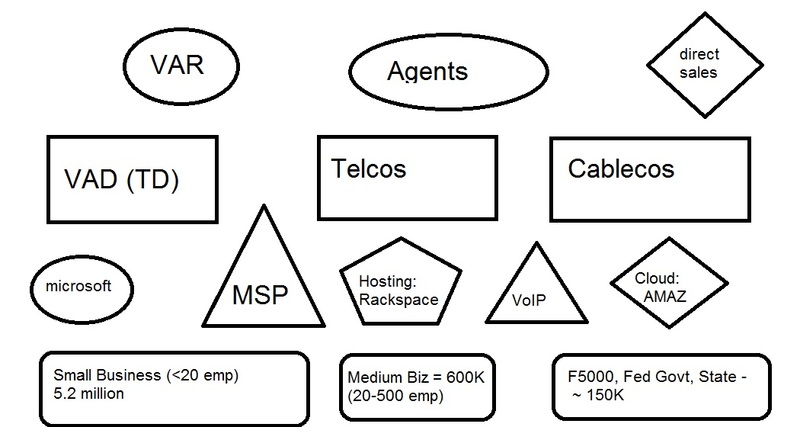 And as you can see from the ecosystem diagram, there are a lot of places to shop - VAD, Microsoft, Google, Amazon, ILEC, CLEC, Cableco, MSP, Rackspace, Web hosts, Parallels, ITSP's, and so much more. And Agents can just partner up with a VAR or MSP to sell their own services, leaving the CLEC's out to dry. It's a matter of control. Do you want to build yourself a business with white-label partners (like VAR Dynamics) or do you want to trust that the telco that is having trouble delivering telecom services reliably will be able to provide you and your customers with unparallelled service delivery of cloud services? We'll see. In the mean time, be nicer to the Agents. They may be all you have left.